Dice, glorious dice! That’s all I think of when discussing Order of the Gilded Compass. 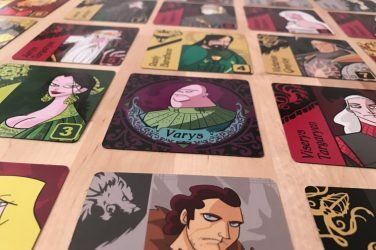 Recently released from Grey Fox Games, Order of the Gilded Compass is a reimplementation of the long out of print Alea Iacta Est and is designed by Jeffrey D. Allers and Bernd Eisenstein. 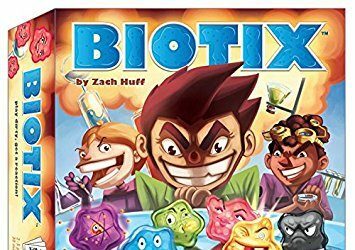 The game is decently quickly and comes with a number of modules, allowing players to customize their play experience each time, a must for what is essentially a game of Yahtzee combined with archeological exploration. 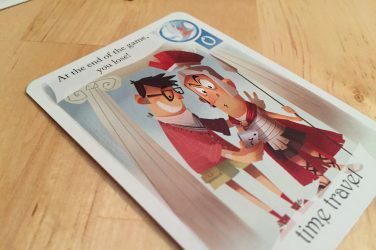 Thematically, the game is interesting, though it doesn’t come through particularly clearly in the components. Each player is a treasure hunter who wants to join what is essentially the Platinum Club of archeologists. 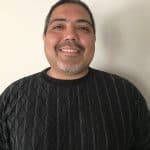 To do this, they will explore various sites, assigning dice to try and win certain locations, diggers, archeologists, and tools that will help them realize their dreams. Read that as a dice placement game with a few options during setup. 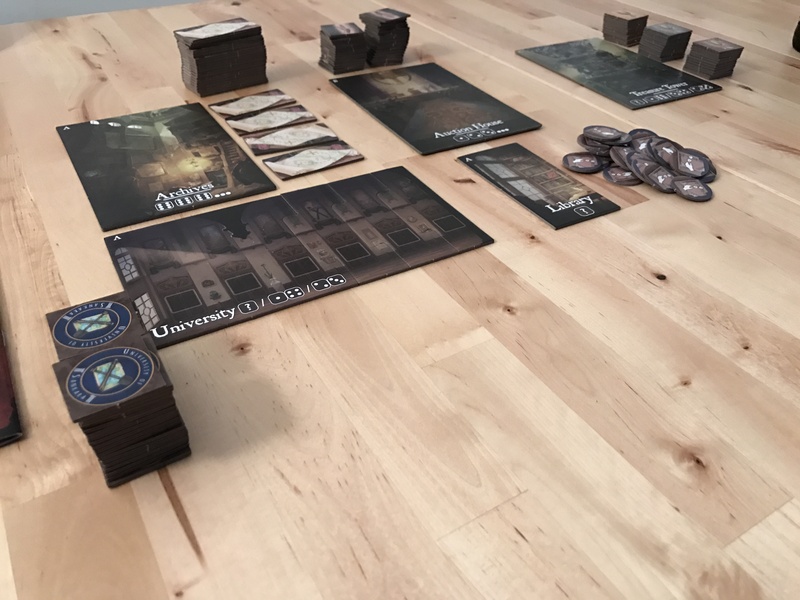 When you start the game, you will place the A buildings on the table – the University, the Archives, and X. You will then select one of the two B buildings (the tile is double sided) and one of the four C buildings (two double sided tiles). The rules are very straightforward and only take up two pages, though each location has its own associated rules. Each player will roll eight dice each turn, placing them on one of the locations to try and best match the win conditions of that location. The University for example has several spaces based on number of players. The lowest dice will always go to the left of the next highest and players will jockey for position. They then draft worker tiles that are randomly placed each round. 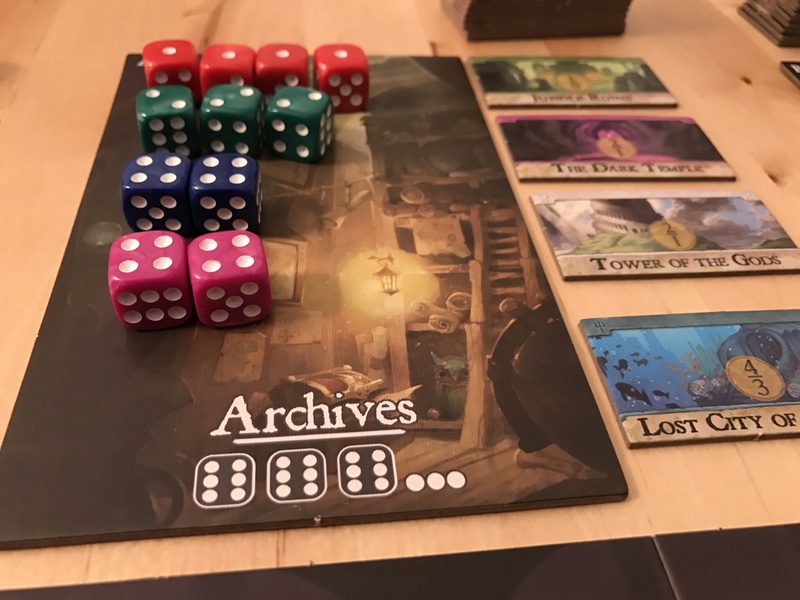 The Archives will have space for just about everyone to try and land a treasure map to a hidden site, but some locations in the B and C stacks only allow 1 or 2 winners for certain spots. Each one is very different and it is that variability that makes the game’s setup so interesting. 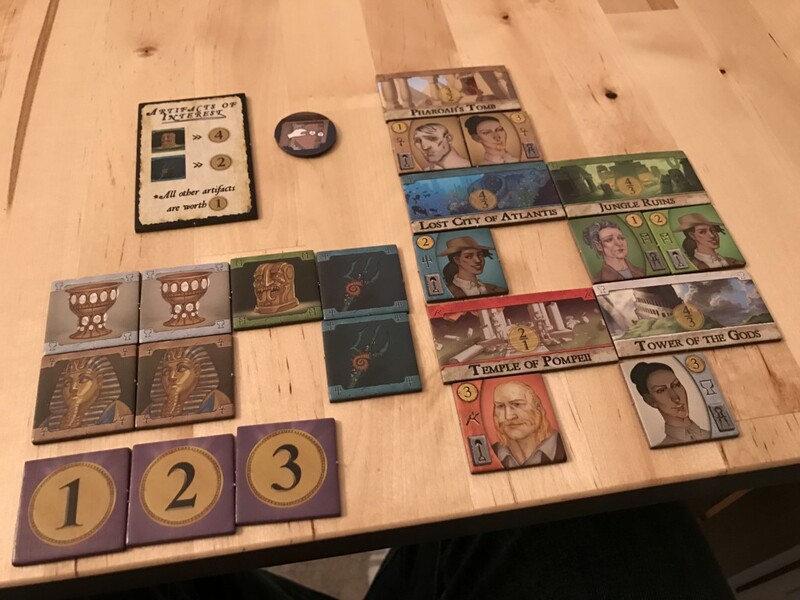 The key to scoring is to get matching colors for your worker tiles and your treasure maps, and then combining that with other scoring mechanisms, whether it is treasures from the auction house that match your hidden win mechanisms, interaction with the Illuminati or sunken treasure you pull up from the depths. After one play I was concerned this game didn’t have enough to it, but I was quickly corrected as I continued to play it. There are a lot of things to like here. 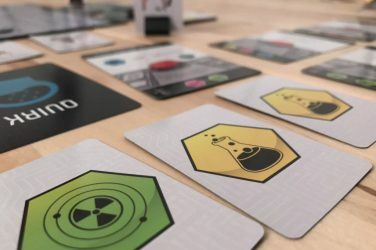 To start, the variable setup makes it a perfect game for those who are tired of the same boring dice rolling mechanics. 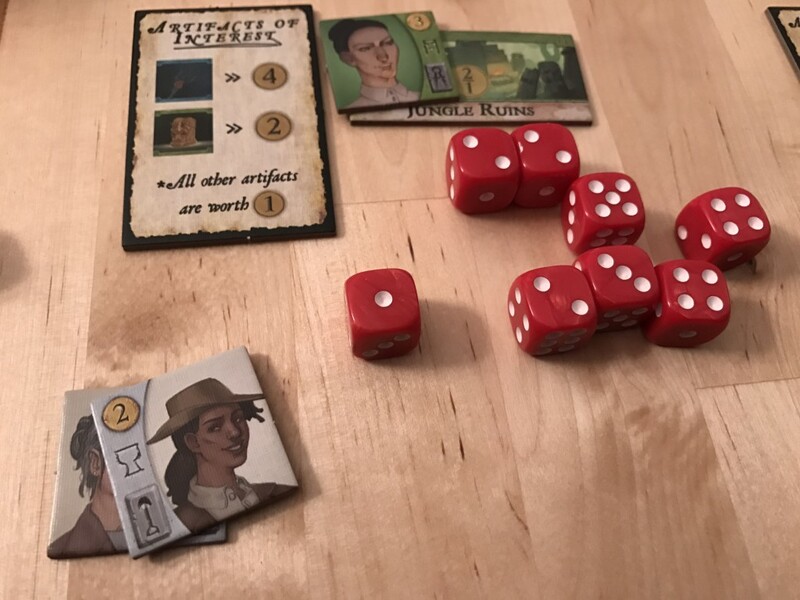 Yes there are dice, but you have five different things to do with them each turn – and that makes it nearly impossible for there not to be a good match for your dice in any given turn. At the same time, the dice component is incredibly quick. You have eight dice, but there will be times when you need to play a straight of dice or multiples of the same face value – putting out three of four at a time. As a result, rounds only take 5-10 minutes and the game really does fly. Because it is so tactical and you only have so many spaces you can go, the game rarely drags, and only when someone suffers from a special type of AP. The scoring is a blast too because of how many different ways you can make it work for you. 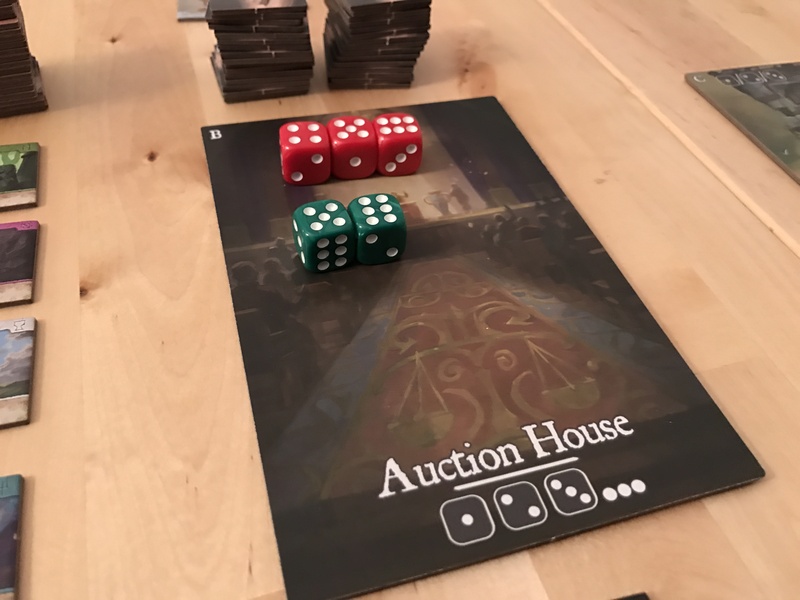 The core scoring mechanism is open information, but the treasures you find, illuminati you interact with, or artifacts you buy at the auction house stay hidden. In case I didn’t make it clear, the theme here is a paste job. That’s not necessarily a bad thing, and what can you really do with a game so heavily reliant on dice, but the lack of variance in the pictures on some of the tiles, combined with the generic looking tile art make the game somewhat forgettable to look at. After a few plays, you may not even look at these items. You’ll see colored tiles and dice. That’s about it. The game is also heavily dependent on those dice. 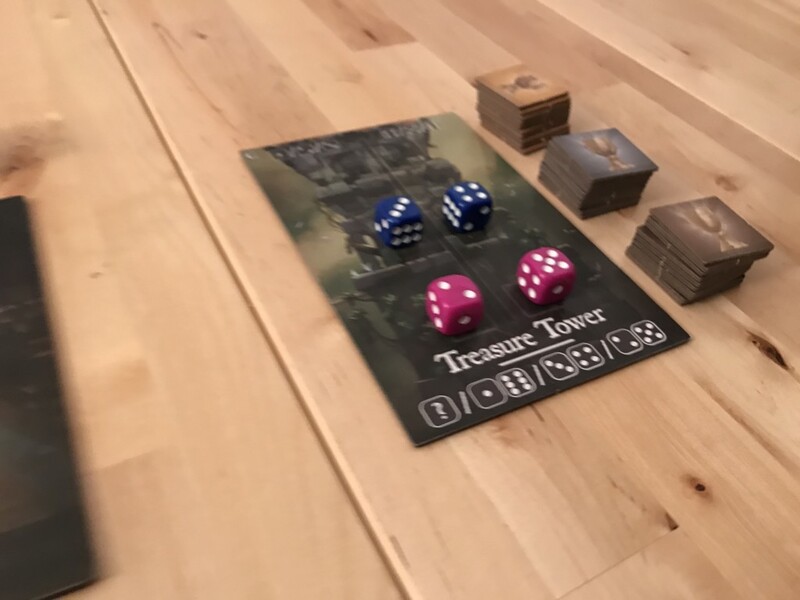 There are reroll tokens you’ll gain when you’re unable to take an action with a placed die in a round, and those rounds can be frustrating, but if you don’t like rolling dice, this isn’t a game for you. I, however, do like dice…quite a bit. That combined with the variability of the setup, the different scoring mechanisms, and the quick speed of play make this one of my favorite new pickups out of Gen Con this year. It’s not a big name game, it doesn’t come out as often as some others, but it is always a welcome play, and I’ve had fun every time. Order of the Gilded Compass is a long overdue reimplementation of Alea lacta Est, and a darn good one. 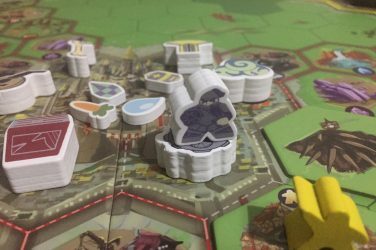 It’s quick, easy to teach, accessible for very young ages, and there are a ton of dice. 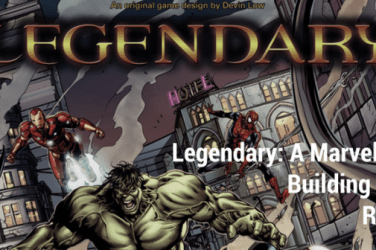 Buy this one if you’re a fan of dice placement games.